How much water is there on Earth? A graphic just posted by the USGS offers a startling view. If you took all the water on earth – in oceans, ice caps, lakes, rivers, groundwater, the atmosphere, and living things – and wrapped it into a sphere, it would have a diameter of about 860 miles. That 860-mile-high sphere is represented by the largest bubble in the picture, which stretches from Salt Lake City, Utah to Topeka, Kan. It has a volume of over 332 million cubic miles. If you popped this bubble with a giant pin, the resulting flow would cover the lower 48 states to a depth of about 107 miles. 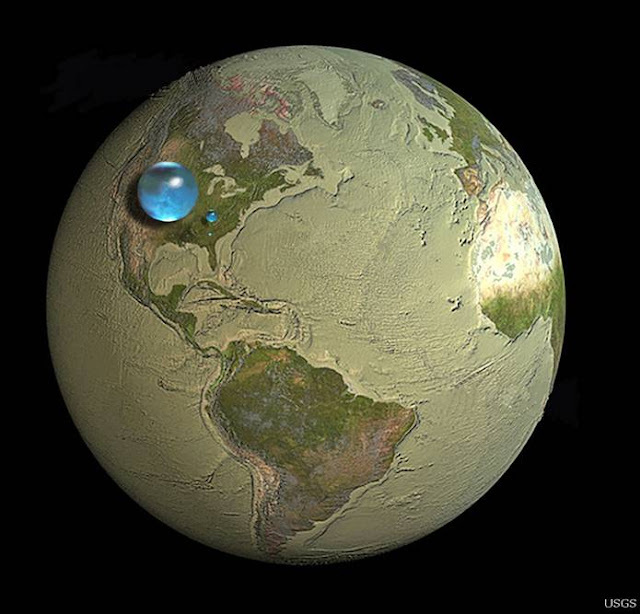 The graphic shows various blue spheres representing relative amounts of Earth's water in comparison to the size of the Earth. Are you surprised that these water spheres look so small? They are only small in relation to the size of the Earth. These images attempt to show three dimensions, so each sphere represents "volume." Overall, it shows that in comparison to the volume of the globe the amount of water on the planet is very small - and the oceans are only a "thin film" of water on the surface. The largest sphere represents all of Earth's water, and its diameter is about 860 miles (the distance from Salt Lake City, Utah, to Topeka, Kansas). It would have a volume of about 332,500,000 cubic miles (mi3) (1,386,000,000 cubic kilometers (km3)). The sphere includes all the water in the oceans, ice caps, lakes, and rivers, as well as groundwater, atmospheric water, and even the water in you, your dog, and your tomato plant. How much of the total water is fresh water, which people and many other life forms need to survive? The blue sphere over Kentucky represents the world's liquid fresh water (groundwater, lakes, swamp water, and rivers). The volume comes to about 2,551,100 mi3 (10,633,450 km3), of which 99 percent is groundwater, much of which is not accessible to humans. The diameter of this sphere is about 169.5 miles (272.8 kilometers). Do you notice that "tiny" bubble over Atlanta, Georgia? That one represents fresh water in all the lakes and rivers on the planet, and most of the water people and life of earth need every day comes from these surface-water sources. The volume of this sphere is about 22,339 mi3 (93,113 km3). The diameter of this sphere is about 34.9 miles (56.2 kilometers). Yes, Lake Michigan looks way bigger than this sphere, but you have to try to imagine a bubble almost 35 miles high—whereas the average depth of Lake Michigan is less than 300 feet (91 meters). The data used on this page comes from Igor Shiklomanov's estimate of global water distribution, shown in a table below. Data source: Igor Shiklomanov's chapter "World fresh water resources" in Peter H. Gleick (editor), 1993, Water in Crisis: A Guide to the World's Fresh Water Resources (Oxford University Press, New York). The Whitewater-Baldy Complex fire in western New Mexico has grown to over 170,272 acres, making it the largest wildfire in that state's history, according to the US Forest Service. The fire is growing in multiple directions, including towards Arizona to the west. The fire began on May 9 from lightning strikes. For updates on the fire, visit the Inciweb website: http://www.inciweb.org/incident/2870/. Proponents cheered the move as helpful to the humpback chub but questions rose almost immediately, including one about the wisdom of spring flushes, on the basis that previous flood tests in the spring benefited non-native fish that eat the native population. Energy managers warned that release of large volumes of river water cost energy consumers $3-4 million each time, and could complicate legal requirements of water delivery from the upper Colorado River basin to the lower. 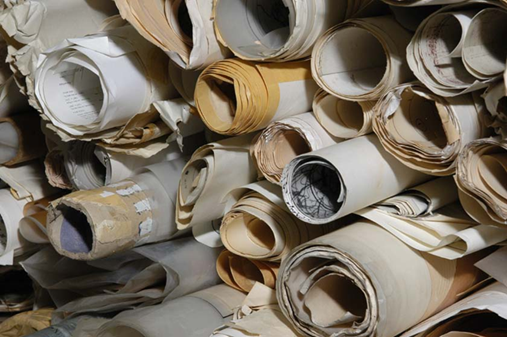 AZGS has been inventorying the historical and technical files we acquired through the merger with the Arizona Dept. of Mines & Mineral Resources last year. Digital librarian Casey Brown is working with Nyal Niemuth, who joined us from ADMMR, with the help of a pair of student interns to complete a comprehensive cataloging of the documents, reports, maps, and files, and then to georeference them all as part of the digitizing effort. Last week, we posted inventories in the online AZGS Document Repository of three of the collections that fill rooms in our Phoenix office. This gives a flavor of the type and breadth of files we are digitizing. Roland Mulchay was the chief geologist for the Anaconda mining company at Cananea. He either examined or received submittals and professional reports on many properties located in the southwestern U.S., northern Mexico and throughout the world. 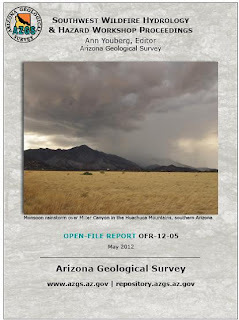 The collected files principally cover Arizona, Utah and Mexico. In the 1930’s the Reconstruction Finance Corporation was created by the Federal Government to finance the development and operation of gold, silver and tin mines. Field engineers visited the mines, talked to the owners, discussed plans, and advised owners when necessary if plans were not detailed enough. They also made recommendations as to whether or not the loan should be granted. These files are the result of their investigations. 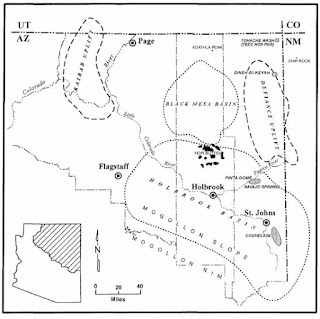 The collection comprises the Arizona mineral exploration files (mostly for gold and copper) of Cambior Exploration USA Inc. The collection also includes information from acquired companies Westmont Mining and Nicor Mineral Ventures Inc. It contains exploration data as well as submittal information gathered during the 1980s through 1999. This project is funded by a one-time state appropriation and a grant from the USGS National Geological & Geophysical Data Preservation Program. We expect it will take three years or more to finish cataloging and digitizing all the ADMMR files and getting them online for free viewing and downloading. Mining and oil production are hot issues in two Congressional races underway in southern Arizona. 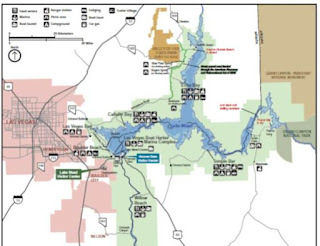 The Arizona Daily Star reports that incumbent Raul Grijalva is the only candidate in the race in Congressional District 3 who opposes the Rosemont copper mine, south of Tucson in the Santa Rita Mountains. The news story summarizes his position as "Jobs are part of the Rosemont discussion, but so are environmental concerns, including water and air quality. There would be a high cleanup cost to taxpayers when the mine closes." His two opponents for the Democratic nomination, Amanda Aguirre and Manny Arreguin point to the jobs that will be created and the new technology that Rosemont plans to use to mitigate environmental impacts. Meanwhile, in Congressional District 8 to replace Gabby Giffords, Republican Jesse Kelly claimed during the Republican primary that the U.S. has "significantly more oil than Saudi Arabia" apparently referring to oil shale, which prompted one of the other GOP candidates to challenge that as unrealistic and urging him to get a degree in geology. [Frankly, I would urge all candidates in all races to take at least one class in geology to better understand natural resources - mineral, energy, and water - and natural hazards and environmental issues, but I digress]. "Kelly supports increased domestic energy production from a range of sources — including coal, oil and natural gas — and has focused intensely on energy during his campaign. He opposes special subsidies to encourage renewable energy sources, arguing that solar companies shouldn't get any breaks that oil and coal companies don't get. [Democrat Ron] Barber also supports more domestic production and opposes higher taxes on energy. He has said tax breaks should be discontinued for oil companies, but that solar and other renewable energy sources should be incentivized." Arizona's reservoirs are well below average for this time of year. 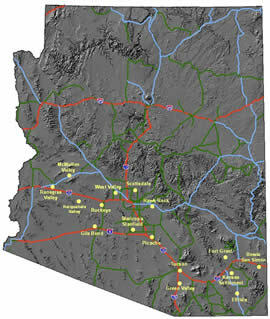 A compilation by the CLIMAS group at the University of Arizona, with data from the National Water and Climate Center [right] shows water storage ranges from 2% to 97% at different Arizona reservoirs. The current storage totals 33,345 thousands of acre-feet, compared to a maximum storage capacity of 56,128 thousands of acre-feet, or 59% of capacity. Most of the reservoirs in Arizona are well below their historical average. Combined storage in Lakes Mead and Powell decreased by more than 500,000 acre-feet in April but is still about 10 percent greater than it was one year ago as a result of the copious winter snow in 2010–2011. The projected water year inflow to Lake Powell is 5.57 million acre-feet (MAF). If this holds true, inflow will rank as the fourth lowest on record since the closure of the Glen Canyon Dam in 1963. Precipitation in coming months could increase or decrease actual inflow, with the likely range falling between 4.9 MAF (45 percent of average) and 6.5 MAF (60 percent of average). 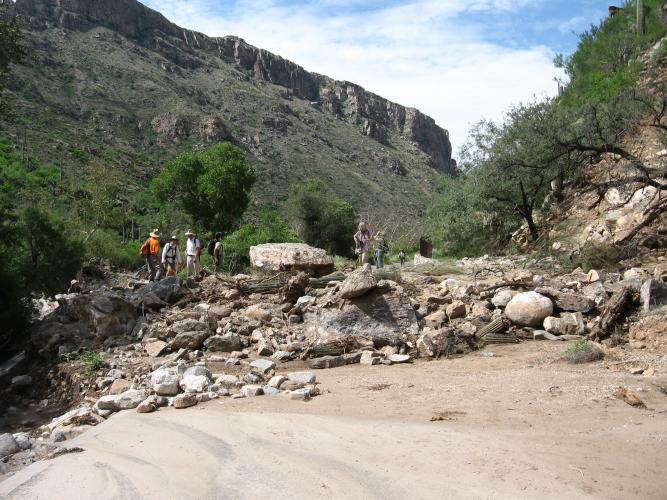 The Salt River Basin system, which supplies water to Phoenix, decreased by about 25,600 acre-feet in April and is about 4 percent above average for this time of year (Figure 6). Storage in the San Carlos Reservoir is at about 2 percent of capacity and is at its lowest level for this time of year since at least 1997, reflecting very low precipitation in southeastern Arizona during two consecutive La Niña winters. They used PayScale's "massive compensation database and job growth projections through 2020 from the U.S. Bureau of Labor Statistics." Forbes listed college majors by "median starting pay, median mid-career pay (at least 10 years experience), percentage growth in pay and projected growth of job opportunities." I missed the field trip to Asarco's Mission Mine [right, credit, Asarco] last Saturday but AZGS Phoenix chief Nyal Niemuth was there and provided some updates. Reserves of 334M tons grading 0.442% Cu and 0.009% Mo with a 1.47 strip ratio were reported, which will provide a 16 year mine life. A $22M capital improvement spending program is underway this year that will include 5 new trucks. 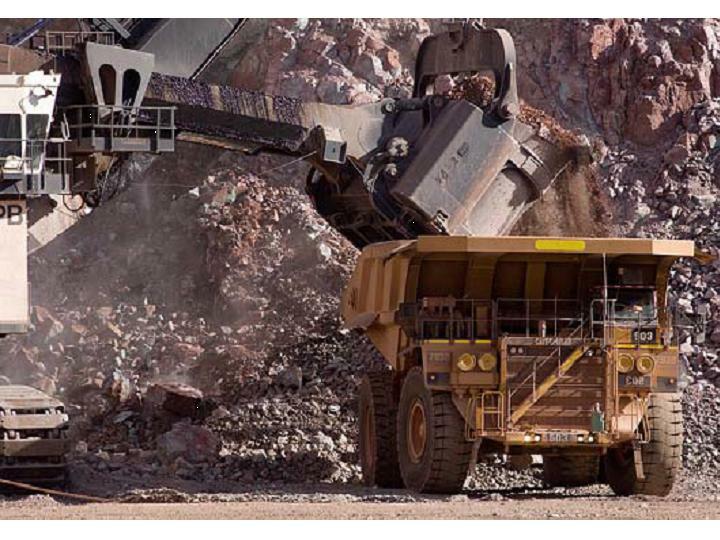 Eventually all the haul truck fleet will be 320 ton Komatsu 930E models, that will require bigger loaders also. A $60M expenditure has been approved to expand the South mill and refurbish the Mo circuit. Mo production should restart in spring 2013 and produce 48K lb/month. A third of the trip was visiting reclamation of 5,124 acres of tailings and dumps in the northern part of the property into sustainable Sonoran desert vegetation. Plans are to reopen the mine as early as fall 2013. There's an aerial tour on the company website that does a great job of showing the mine in relation to Tucson, San Manuel, Summerhaven, and roads through the Santa Catalinas. What's going on in eastern Arizona? Suddenly the area is a hot bed for more unusual natural resources like potash, carbon dioxide, and helium. Teri Walker, reporter with the Holbrook Tribune-News interviewed me for a story in yesterday's paper about the looming global helium shortage and the rich deposits in the region. During the interview she commented that for the small towns like Holbrook, these developing projects will have a huge impact. Two companies are moving forward with plans for large underground potash mines outside Holbrook, costing over $ 1 billion each, with the potential for annual revenues of similar amounts [right, core drilling near Holbrook. Credit, Passport Potash]. Kinder Morgan, the nation's second largest pipeline company, announced plans to complete 250 wells in the St. Johns area to produce 400 million cubic feet of carbon dioxide per day and ship it to Texas for enhanced oil recovery projects. And now helium is back in the news. The next few years may see some of the biggest changes the towns of eastern Arizona have seen since they were founded. The folks at Spatial Energy forwarded this Digital Globe false color satellite image of the Gladiator Fire south of Prescott. 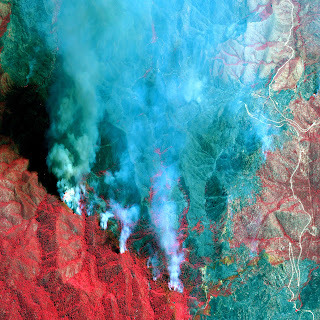 "In this image the burnt areas are dark blue and red is healthy vegetation, smoke from the fire is mostly white. 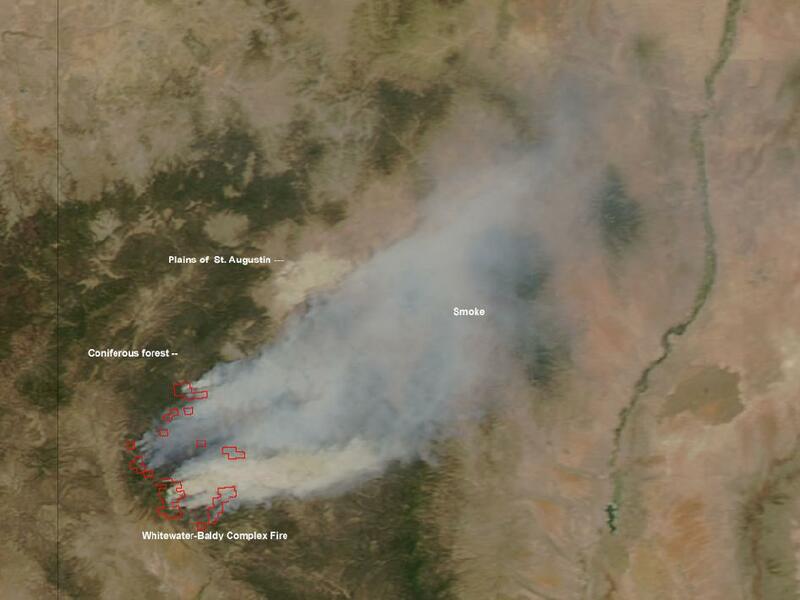 Flames can be seen along an active fire line on the left portion of the image." 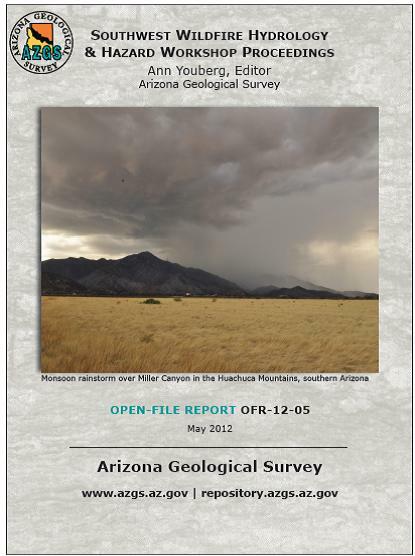 See the USGS 2008 report and AZGS 2006 report for more details. A National Park Service hydrologist wrote in an internal email, “The DEIS goes to great lengths in an attempt to establish impacts to water resources from uranium mining. 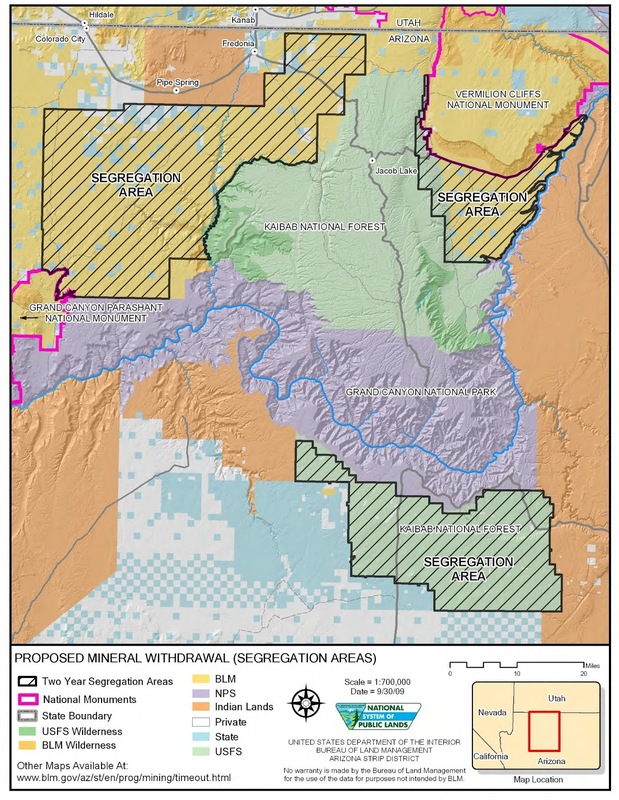 It fails to do so, but instead creates enough confusion and obfuscation of hydrologic principles to create the illusion that there could be adverse impacts if uranium mining occurred.” He notes that “previous studies have been unable to detect significant contamination downstream of current or past mining operations” and that “adverse impacts to water resources” is not a reason to be concerned about potential uranium mining operations. I recognize the Secretary's right to make such decisions on a variety of grounds including political, but today's release challenges the claim that this particular decision was science-based. Addendum: Only a handful of emails were released by the House Committee. We don't know if there were contrary opinions inside the Park Service or how these concerns were ultimately handled. There is also the matter of 399 pages of materials that Interior did not give the House in 2009 and that the House is going after again. So, there are more aspects and details on this story that are yet to come. I got two publications in the mail this week from the Girl Scout Research Institute (I didn't know such an office existed), that offer some really positive news. One, looking at the 59 million alumni of the Girl Scout program, found that one half of adult women were Girl Scouts at some point, and those that were, have been more successful in their lives. With this being the 100th anniversary of the founding of Girl Scouts of America, 2012 is declared the Year of the Girl. The second publication is titled "Generation STEM: What Girls Say about Science, Technology, Engineering, and Math." And the results are surprisingly encouraging. A long standing problem has been that girls in general seem to lose interest in STEM fields "despite high achievement in academics and other career fields," so that women are underrepresented in STEM careers. Seventy-four percent of high school girls across the country are interested in the fields and subjects of STEM. Girls are interested in the process of learning, asking questions, and problem solving. Girls want to help people and make a difference in the world. and are exposed to STEM fields. opportunities—STEM is just one area of interest among many. It concludes with a list of 10 actions for individuals (parents, teachers, role models) to take to get past the hurdles keeping girls from realizing STEM in their future. For me, the take away message is that girls are ready for STEM fields, we just need to figure out how to engage them. Coincidentally, we have a record size class of interns this summer, and it looks like young women comprise at least 75% of the group. The yellow dots on the map at right indicate areas where land subsidence maps exist and can be viewed online. 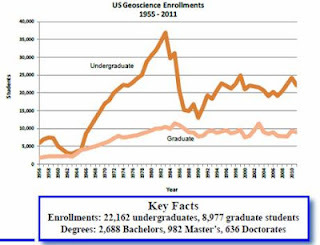 Geoscience enrollments and degrees drop in U.S.
the 2008-2009 levels. 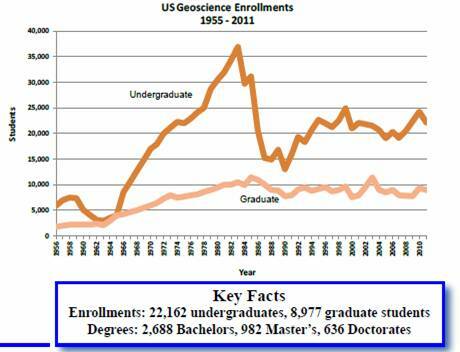 Degrees conferred dropped by similar percentages." It's not clear this is part of a trend. There is a fair amount of variation from year to year, and the previous year was higher than average for the past decade or two. 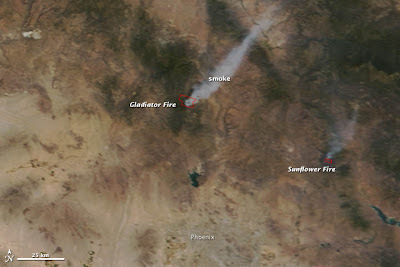 On May 16, 2012, at 9:55 a.m. local time (16:55 Universal Time), the Moderate Resolution Imaging Spectroradiometer (MODIS) instrument on NASA’s Terra satellite acquired this image of the Gladiator and Sunflower wildfires in Arizona. Both fires were burning on National Forest lands north of Phoenix. The Gladiator Fire began on May 13 and by May 16 had prompted an evacuation order for the historic mining community of Crown King, which is not clearly visible in this image but is just south of the fire. By May 17, the blaze had burned 6,573 acres of ponderosa pine and chaparral, and firefighters considered it 5 percent contained. The Sunflower Fire began on May 12 and had burned 12,500 acres by May 17. It was not a threat to any nearby communities. Inciweb. (2102) Sunflower Fire. Accessed May 17, 2012. Inciweb. (2102) Gladiator Fire. Accessed May 17, 2012. NASA image courtesy LANCE MODIS Rapid Response. Caption by Adam Voiland. The wildfire season is underway in Arizona so the timing is right for the publication of the proceedings of a recent workshop held at the Biosphere2, on the subject of wildfire hydrology and hazards. AZGS has compiled the abstracts, slides,and posters from the 32 presentations at the conference in electronic format available at our document repository. 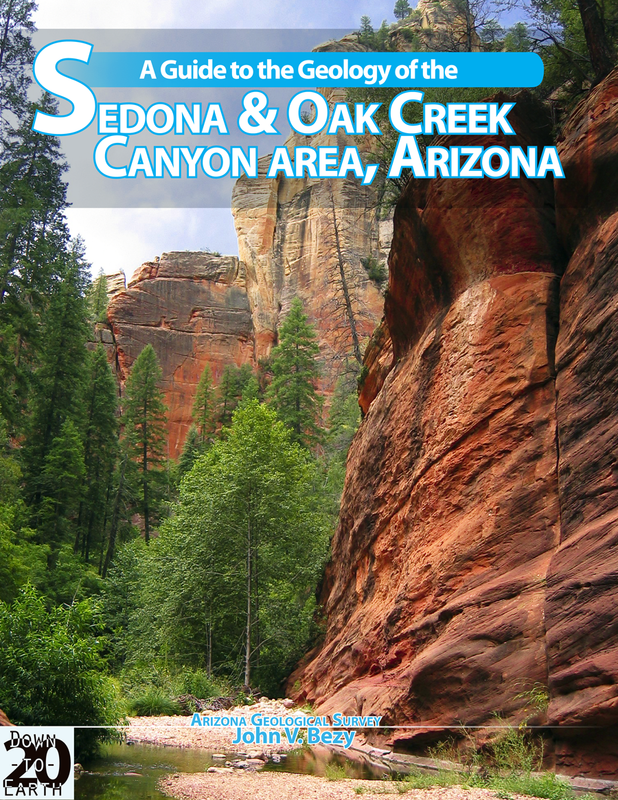 AZGS has a new guidebook in our Down To Earth series, A Guide to the Geology of the Sedona & Oak Creek Canyon Area, Arizona, written by well-known local geologist John Bezy. It's available for $8.95 in the AZGS Store or by mail order. We expect it will be carried in a number of park stores across northern Arizona. A magnitude 2.1 earthquake is reported by the USGS, about 20 miles northeast of Lake Havasu City in western Arizona. The quake occurred at 12:47 AM local time this morning. The USGS has a new website for earthquake visualization, and while it has some new user functions, overall I find it to have less information than the old site. The American Copper Council is holding its annual meeting at the Biltmore Hotel in Phoenix this week. The American Copper Council is a " not-for-profit trade association representing all segments of the copper industry. Incorporated in 1975, the Council's 120 member companies include producers, scrap dealers, brass and wire mills, fabricators, consumers, merchants and brokers." 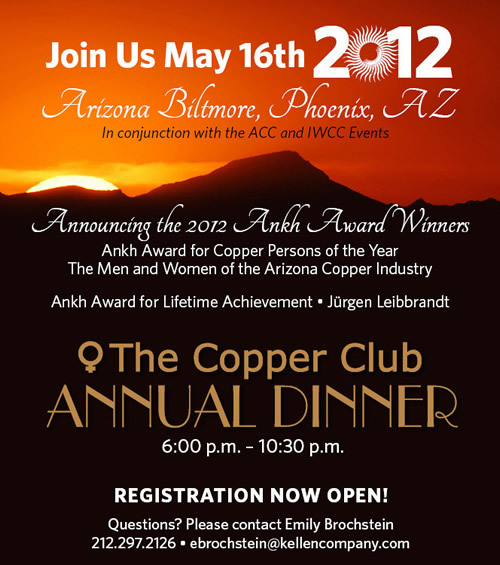 At last night's Copper Club banquet, the Ankh Award for "Copper Persons of the Year" went to the men and women of Arizona's copper mining industry, which was accepted by Governor Jan Brewer, the evening’s keynote speaker. May 13-19 is also the first International Copper Week. We learned today that the Arizona Geological Survey has been selected to receive a Special Achievement in GIS (SAG) award at the 2012 Esri International User Conference in July in San Diego. 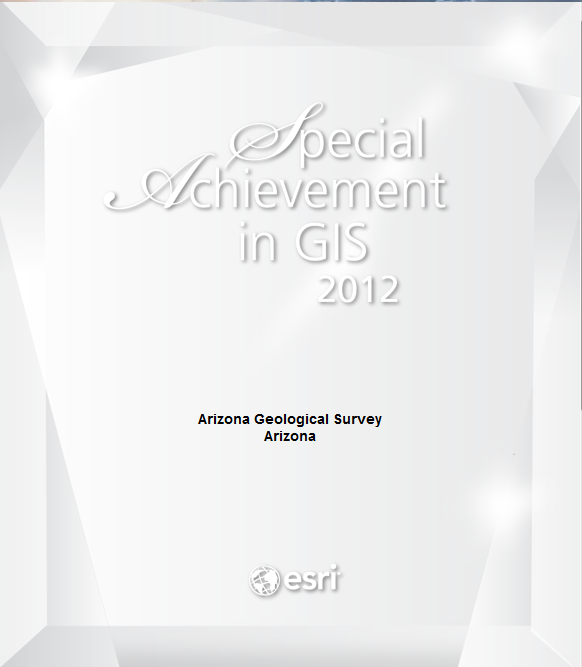 "This award is given to user sites around the world to recognize outstanding work with GIS technology." Esri's message said that "Your organization stood out from more than 100,000 others." The “Arizona Experience” website is what brought us to their attention. responders to meet, converse, and begin to plan protocols for any future volcanic activity in the American Southwest states of Arizona, Colorado, New Mexico, Nevada, and Utah, which host Holocene volcanic eruption deposits and are vulnerable to future volcanic activity. 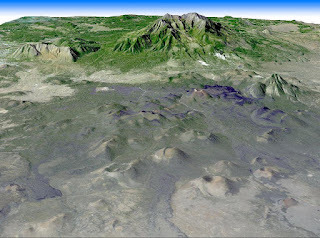 The last volcanic eruption in Arizona was about 1,000 years ago in the San Francisco volcanic field that includes Flagstaff [right, credit USGS] That field has been active for 6 million years, with an eruption on average every 3,000 years. 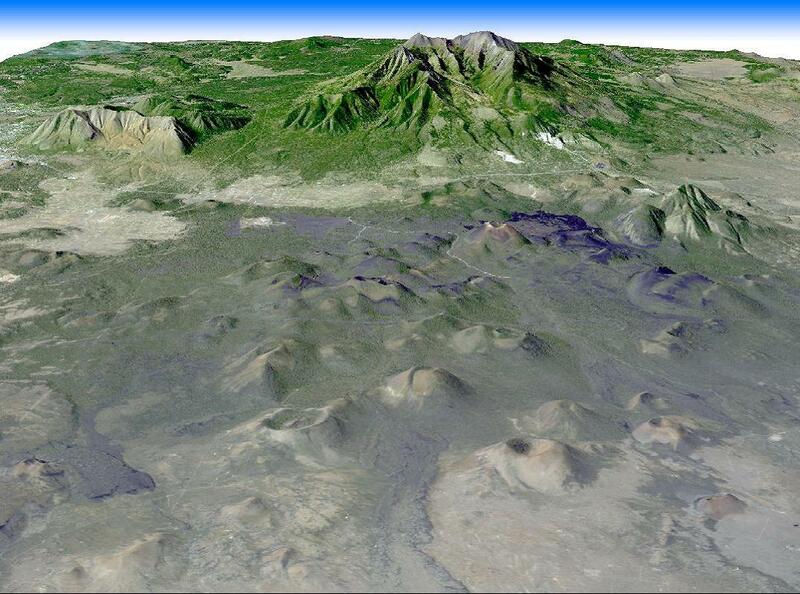 3) Do you also intend to attend the field trip to the San Francisco Peaks Volcanic Field? The House Committee on Natural Resources held hearings in April on the Map it Once, Use it Many Times Act (H.R. 4233), the Federal Land Asset Inventory Reform Act of 2011 (H.R. 1620), the National Strategic and Critical Minerals Production Act of 2012 (H.R. 4402), and the Soda Ash Royalty Extension, Job Creation, and Export Enhancement Act of 2011 (H.R. 1192). H.R. 4402, introduced by Representative Mark Amodei (R-NV), defines strategic and critical minerals as minerals necessary for national defense, the nation’s energy infrastructure, to support domestic manufacturing, and for the nation’s economic security. Any mine that could provide strategic and critical minerals “shall be considered an ‘infrastructure project’ as described by a March 22 Presidential Order. It would limit the total review process for mining permits to a maximum of 30 months unless signatories agree to an extension. H.R. 1192 would extend a reduced royalty rate of 2% for the development of soda ash, which expired in 2011, through October of 2016. The Natural Resources Committee held a hearing on H.R. 4402 and H.R. 1192 on April 26. The threat of a worldwide helium storage is attracting front page headlines (Tucson's Arizona Daily Star) and a Congressional bill to halt the near give-away of U.S. reserves. 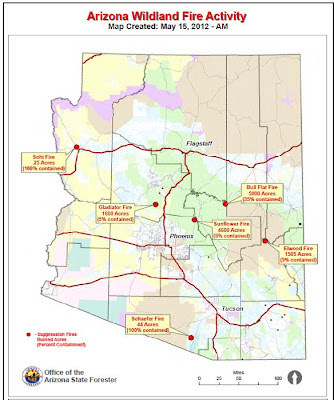 But neither of the stories I read yesterday mentioned Arizona's helium resources and efforts underway to develop them. 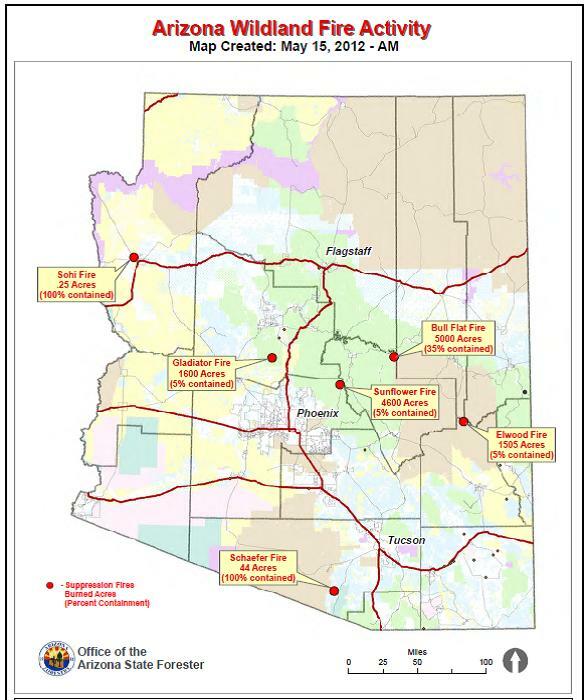 The Arizona State Forester, Scott Hunter, has released a new online interactive mapping application that allows you to track the progress of wildfires across the state. The version at right is a static pdf version but the live version allows you to zoom in and see the fire perimeters. The service is similar to the federal GeoMAC site that only covers large fires. 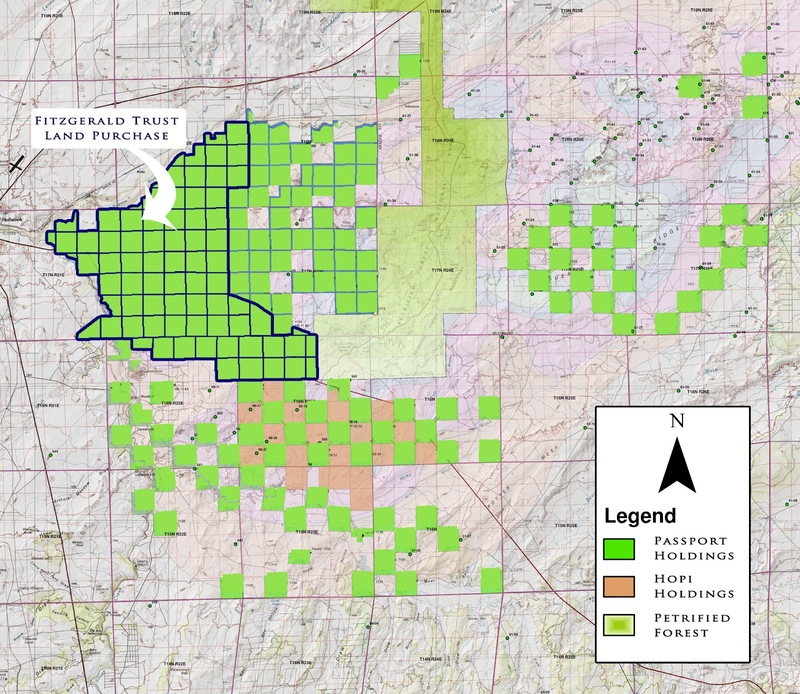 The company said that "On closing of this acquisition Passport's holdings will include approximately 70,000 acres of contiguous, royalty free, private land. 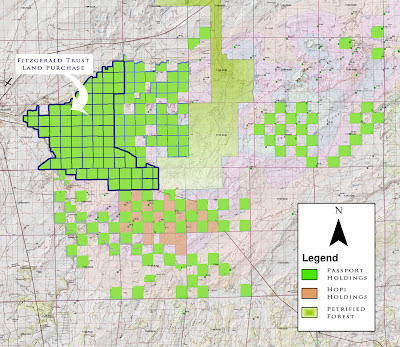 Combined with Passport's 52,000 acres of public land, their land package will comprise over 122,000 acres." This acquisition provides additional BNSF railway frontage along the north side of the property, as well as 13 miles of frontage on highway 180 on both the north and south sides of the highway. The purchase price is approximately US$360 per acre, for a total purchase price of US$15 million dollars. Passport said they are looking at a number of financing options to close on the property later this year. 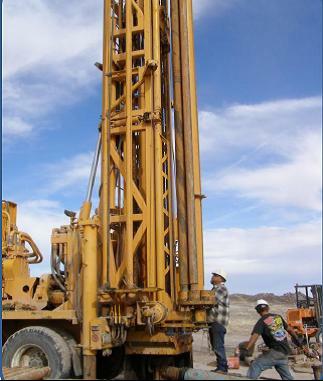 Passport last week announced the first results of their 2012 core drilling program, reporting 3.05 metres of 17.07% KCl from drill hole PPI-2012-01 and 1.99 metres of 16.82% KCl from drill hole PPI-2011-31. 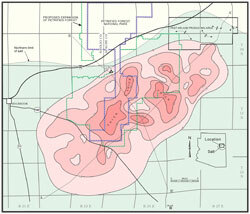 Included within the potash interval of PPI-2012-01 were 0.99 metres of 27.83% KCl which included 0.23 metres of 45.43% KCl. Included within the potash interval of PPI-2011-31 were 0.70 metres of 28.37% KCl which included 0.17 metres of 41.00% KCl. A number of donors have stepped up to allow the Central Arizona Geology Club to continue to hold their monthly meetings at the Prescott Library. The city library announced imposition of fees this coming Fall, which forced the Club to consider charging dues, finding an alternate location, or folding up shop. The cost to rent library's Founder's Suite A & B, where the Club meets, will be $30 for 2 hours, $50 for 4 hours. Club organizer let us know that they have decided that we will continue to meet at the library under the "sponsorship" system. Eight sponsors are donating enough to cover the meeting costs for the next season. There will still be no dues and they will continue to pass the hat to help pay gas costs for out-of-town speakers. The Club will continue to rent the Founders suite from 6:00 - 8:00 with the meetings still starting at 6:30. Wired magazine posted a collection of satellite views of open pit mines from around the world that are visually striking. 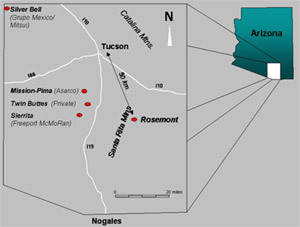 Only one, the New Cornellia mine from Ajo, is from Arizona. 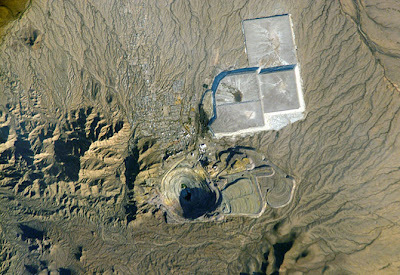 Wired described the NASA photo at right, as "Copper was first mined from this area just south of the mining town of Ajo, Arizona, around 1750. The open-pit mine pictured above began being excavated in earnest in 1912. It was shut down in 1983 when the price of copper dropped. 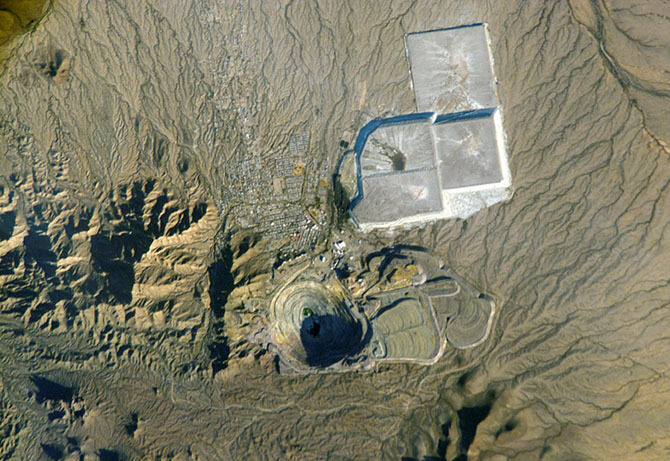 The scalloped land just to the right of the mine is covered in tailings, and the large gray rectangles above that are containment ponds where the metal was extracted." Last week the Dept. of Energy held their annual Peer Review in Denver for all federally-funded geothermal projects. Our project review was given more time to present because of the scope and complexity of bringing digital data in from 44 states as nodes on a national distributed network. The AZGS project, run by us on behalf of the Association of American State Geologist, has the largest funding from DOE of 170 or so projects in the nation. The reviews by the panel are expected in the next few weeks. Last year, reviewers described it as one of the best run in the nation. The bigger challenge was the "Go/No-Go" review by DOE of the National Geothermal Data System run by Boise State University. That project has had numerous problems and delays and was shut down in 2010 by DOE to develop a redirection plan. That was finally adopted one year ago and last week's review was to determine if it's working. If not, the project could be terminated. AZGS is the subcontractor to design and build the system architecture. That has been successful as evidenced by our deployment of it among the 50 state geological surveys as an operational national data network, arguably the first-such network in the geosciences. BSU, however, has been unable to implement and deploy the network among its partners or to build the user interface and desktop applications. In the last three weeks, BSU seems to have recognized that progress has not met expectations. They are now bringing in a number of private sector firms to help get the project on track. Over the next two weeks all the project members will be rescoping their work plans and budgets to accommodate these changes. AZGS will need to get the new project members up to speed on the data integration framework using the open-source standards and protocols we've implemented. The new proposal for the user interface looks to be a powerful tool. All DOE-funded projects are required to submit their data into the NGDS for public access. Thus far, only a handful have been able to do so. I'm way behind on posting to this blog. For the past month it's been nearly non-stop travel to meet our growing commitments. But I expect to be in the office for much of the next three weeks and will be trying to catch up. The Forum on Geology of Industrial Minerals in Scottsdale was a great success. Attendance was up at least 25% over recent years. 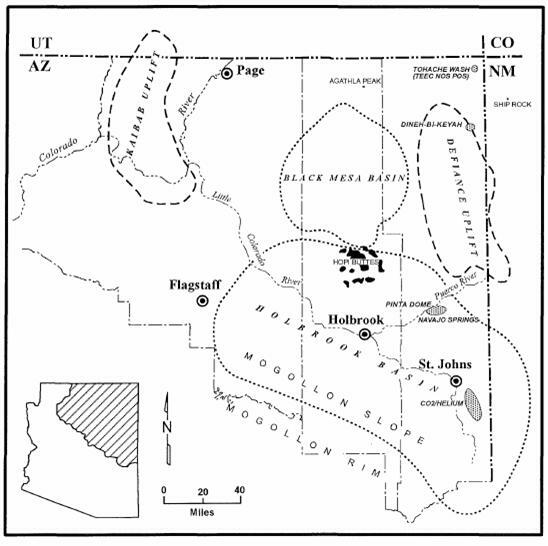 Doug Shakel led the multiple field trips across the Plateau, Phoenix Valley, and the Copper Corridor. While I was chairing that, our tech team was in Denver running a multi-day workshop training 30+ state geological surveys how to serve their geological maps online in compliance with the global OneGeology/GeoSciML standards. The NSF EarthCube initiative is rushing forward. We are on a 3-month fast-track to develop a 10-year roadmap for cyberinfrastructure for the geosciences. AZGS is chairing the Governance Roadmap Steering Committee with a dozen coalitions representing more than 60 organizations and institutions. The draft roadmap has to be delivered by June 12 at a 'charrette' being organized in the DC area. NSF expects to release solicitations by the end of the year based on the roadmaps the community is developing. Hundreds of millions of dollars will be invested in this as part of the national "Big Data" initiative and related efforts. Last week the Dept. of Energy held their annual Peer Review in Denver for all federally-funded geothermal projects. Our project review was given more time to present because of the scope and complexity of bringing digital data in from 44 states as nodes on a national distributed network. 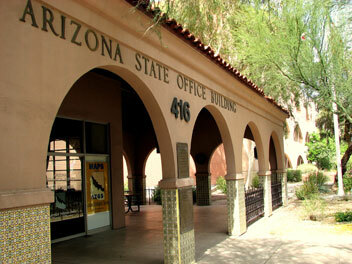 The AZGS project has the largest budget of any of the DOE projects. The reviews by the panel are expected in the next few weeks. 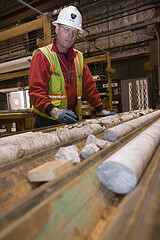 At last year's review, the State Geothermal Data system was just getting into production mode. We had 13 web services live online. Now, all the State Geological Surveys are trained and in full production mode. This time, we noted that 570+ web services are providing millions of data from a nationally-distributed network and new data sets are being added weekly. During the next year, the amount of data will explode. 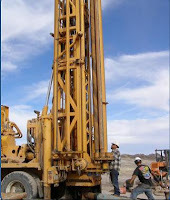 I'll elaborate more on the Geothermal Data System projects in a follow-on post. The new issue of the Arizona Hydrologic Society newsletter brings together a number of items about Lake Mead water supply [right, credit National Park Service ]. AHS President Alan Dulaney notes that "Water levels in Lake Mead are only eight feet away from triggering such a declaration in April 2011, but creative water accounting, releases from Lake Powell, and forbearance by some parties may push back the declaration date by two or three years. But not forever. Excess water will disappear first from the CAP canal, potentially by 2015, then agricultural water allocations will be reduced." 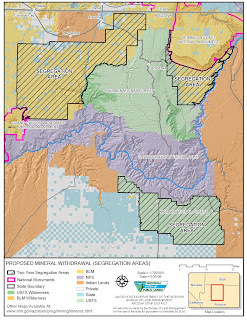 A couple weeks ago, Arizona Republic reporter Shaun McKinnon (who blogs at Waterblogged) described plans for Arizona to leave part of its share of Colorado River water in Lake Mead this year. "...water officials would pass up billions of gallons that they could take from the river in 2011, hoping to keep the drought-stricken reservoir full enough to avoid triggering automatic cutbacks. Any cutbacks could deny Arizona and Nevada even more water in 2012." Then, right after Christmas, Shaun reported that "Mexico will leave part of its Colorado River allocation in Lake Mead for the next three years, slowing the decline of the drought-stricken reservoir and possibly delaying the onset of water rationing in Arizona and Nevada" while Mexican farmers recover from the April earthquake that damaged water systems in the region. But these are one-time actions that seem to at best only delay shortages unless the drought ends or consumption drops.